How Can You Quickly Find the Right Word When It Matters Most? Imagine having a resource at your fingertips that allows you to quickly find the right word when it matters most. Then imagine refreshing your knowledge every week so you can confidently use confusing English words correctly. As a professional, you know people pay attention to your ability to communicate accurately. Others rely on you for that! But having the right word at your fingertips hasn’t always been easy—until now. Here’s a solution that enhances your excellence every day (not everyday). Surprise bonuses on better writing along the way! Your Word Tripper of the Week hones your knowledge and keeps the learning alive. And its usefulness has been time-tested for more than a decade. 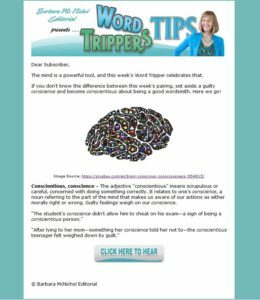 How Did Word Trippers Tips Come About? As an expert editor of nonfiction books and articles, I’ve been on a crusade to curb the misuse of words through Word Trippers. I keep creating Word Tripper of the Week because I know we’ll never run out of words that trip us up.